In a press release dated December 29, 2017 the Ministry of Labor along with the Minimum Wage Determination Committee have announced the minimum wage to be effective for the year of 2018 as shown in the table below. The Official Gazette related to this change has yet to be released. 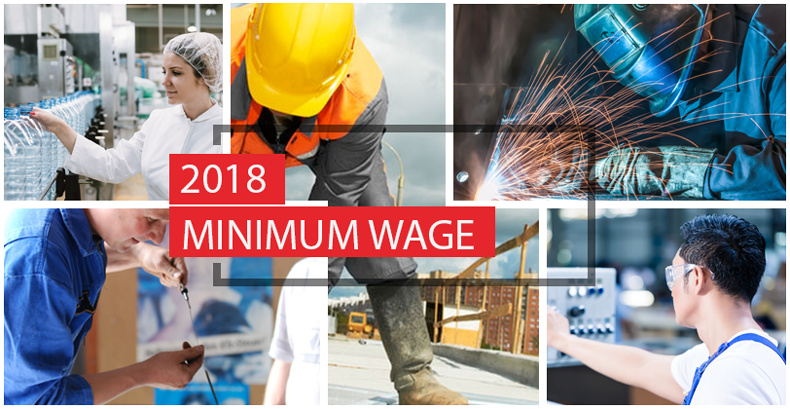 According to the General Social Security Law numbered 5510 Article 82, the lower limit of daily earning subject to premiums is one thirtieth of the minimum wage (1/30), and the upper limit is 7,5 times the minimum wage. In accordance with this information, the monthly floor and ceiling levels for 2018 are as stated below. c. The Amount to be taken into account for discount calculation purposes related to the "Minimum Survival Allowance", which will be effective as of the start of 2018. In order to calculate the Minimum Survival Allowance amount, the rates determined in accordance with the employees’ marital statuses are applied to the amount stated above. One twelfth (1/12) of the income tax amount calculated over the Annual Minimum Wage Level is discounted from the employees’ income tax payable on monthly basis.